The yield curve is a sign of liquidity and as such, has provided good signposts for the long term prospects of the stock market. So lets take a look at what the yield curve looked like at the top and bottom of the markets. And what it says now. The first chart shows the yield curve. The first line (burgundy) in the chart is the flat to negative yield curve we saw at the market top in March 2000. 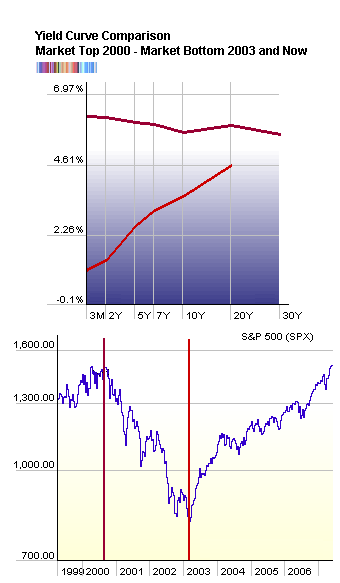 The other line (red) is the very positive sloping yield curve we saw at the bottom of the bear market in March 2003 (there was a temporary suspension of 30 year bond auctions during that time which is why you don’t see data for that security). And now, we are once again seeing a flat to negative yield curve similar to the 2000 top (not shown on graph). Does this mean that the market is in trouble? You have to remember that the Federal Reserve, unlike the myth they like to perpetuate, doesn’t really control anything. Instead, they do their best to mimic the dictates of the bond market. The short term, 90 day bond rate bottomed in the summer of 2003 and rallied almost non-stop. But beginning last year and continuing this year, it has put in a beautiful rounded top formation. And just recently the 90 day T-Bills rate carved a triple top and then fell through support at 4.75%. This is the largest discrepancy between it and the Fed funds rate since right after September 11, 2001. The clear message of the bond market is a Fed rate cut. Which would will reshape the yield curve to once again be positively sloped.